I am glad you guys found parkour and seem to be super enthusiastic about it. However, I am going to give you a little advice which I hope you will consider. Your basics are very poor. Your landings and rolls are worse. You guys are damaging your bodies by doing all these jumps, vaults, and flips with such poor form. Sooner or later, you will get injured, and in the long term, if you dont improve the basics, you will eventually incurr more injuries. So here is my advice. Put the camera away and save the next video for a few months down the road. Instead, focus on mastering your basics so that you can continue to do parkour for a long time. Your landings on basic jumps need work, let alone your vaults and flips. Practice your technique on ground level and once you have it mastered, you can then advance to taller obstacles and acrobatics. 0:00-1:03 - this intro took way too long, i fast forwarded through it all. 1:07 - ouch, looked like your knees almost snapped on that jump. if you cant jump that high cleanly, roll or plant onto it or something. 1:18 - really bad landing. 1:26 - sloooooow climb up. dont use your knees unless you enjoy long term bruising and calcium deposits. 1:49 - slow climbs, why are you walking afterwards? keep running after everything in your video and it will look much better. 1:54 - im not even sure what that was but the landing tells me you cant handle it. on backflips you need to jump higher before you start your rotation. you also need to tuck or at least hold a tighter air posture. 2:19 - flailing around in the air and terrible landings. you guys arent ready for these drops. 2:26 - you all need much improvement on form and landing. 2:29 - reach farther over the table and the vault will be easier. land 1 foot at a time and continue running in stride. the flips are really bad. most them arent even done straight over. need to work on the jump, height, tuck, and landings. some people follow the meter rule but it is pretty strict. how bout you guys dont jump anything over your head height for the first year. that will get your body conditioned and ready for higher. train ground level moves, they are what will most likely be used most in a real situation. Demon knows his stuff guys. no worries man, we are all here to help each other. good to see you being open minded to constructive criticism. it is a great way to improve. I would reccomend investing in some running shoes. It looked like you guys were running around in skate shoes. The flat soles are ment for skating, not running and they force you to take a different stride. It will be very beneficial especially at your age to get some running shoes and wear them all the time. I wore skate shoes for 4 or 5 years and doing so seems to have really f#cked with my stride, both my walking gait and running. If you we're wearing skate shoes, then ignore all this rambling but if you were please heed the advice of someone who would do things differently had he been fortunate enough to recieve this advice years ago. O yea P.S. to my last message im one of the overlords for AIR 21 crew. Dude just lay off you do what u want and we'll do what we want. Plus how do we know what is and isn't parkour theres no rule book and we've only been doing it for half a month so what ever. If one of thoes russian guys tells us that then yea we wont consider it parkour but hearing it from you is not even close to being enough to get us to reconsider. So until you can match up to thoes russians dont be going around tell people what is and isn't parkour because the fact is you dont even know every thing there is to know so lay off. Go easy on him guys, they don't come much more ignorant than this. In what way will a flip help you move from point A to point B efficiently? Say you were being chased by someone, you wouldn't get up on a picnic table and do a backflip. Alright everyone just lay off, i completely understand that flips are not parkour, ive seen the video many times, i just learned flips about 6 or 7 days ago and thought it would be cool to put it in our movies to add some spice, yea i understand it does look excesive and i also understand that we shouldnt put flips in at all to let alone call it parkour, so we are gonna lay off of doing the flips in our movies and more focused on the training that parkour gives us, we've been looking at some of demon's tutorials which are great btw and they are a help to us improve upond just about everything. Oh...my gosh.Â Demon.Â I am going to take your advise and go easy.Â But Seriously...I had been practicing the philosophy for about 1 month and realized that flips are not parkour.Â I didnt even do that much reading and training at the beginning...THERE IS ONLY ONE FORM OF PARKOUR!!! 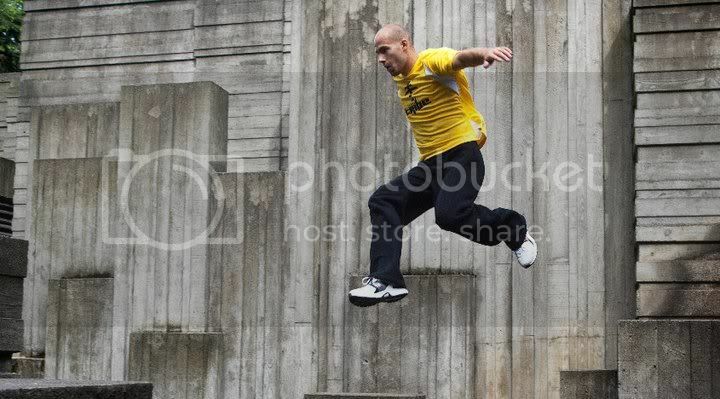 !Â What they were doing in the video was REALLY bad Free Running. Mostly everthing has been said to you guys already about the video but seriously...If you keep hyperflexing your knees (bending past 90*) your knees are going to explode.Â PLEASE practice that in your next training session.Â You guys, Seriously have a lot of potential!! !Â Just please practice safty first off PLEASE.Â With you guys if you all went to an open gym or something you would all your back tucks 20$ and 1 hour later.Â I hope that you guys atleast know that Flips are not parkour.Â But of course you have to know that already. Oh and Air 21 Crew.Â There is NOTHING wrong with doing flips.Â You learn and grow on those SERIOUSLY!Â Just dont call it parkour.Â And the person who hosted it never called it parkour so you guys are in the RED! !